Anthony Blake consented to write a few words as an introductory impression to our idiotplayers rendering of the song “Pennies from Heaven” by Johnny Burke and Arthur Johnston. I mentioned to him that I would also write such an introduction. We offer them here as two found introductions to this piece. 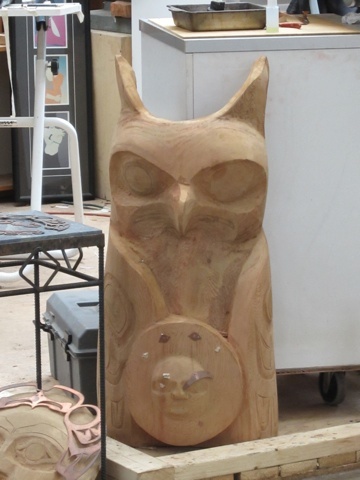 Owl in a Workshop, Vancouver B.C. In my book Gymnasium of Beliefs in Higher Intelligence, I constantly hark on the theme that whatever might be ‘higher’ than ourselves will not speak to us according to our ideas of what is higher or important. To put it crudely, we would more likely find an angel in a rubbish tip than in a bank. The world of popular songs taps into this instinctive wisdom, celebrated in that wonderful book Gods of the People by Denis Saurat (who so admired Gurdjieff’s All and Everything). It surfaces as the gut-felt belief that heaven does shower us with blessings — pennies from heaven — even though we largely ignore them. What is spiritual must be freely given to us to every moment. We just don’t get it and complain all the time. The idiotplayers’s rendering of the song, done with such feeling, is a restorative tonic. ‘If you want the things you love, you must have showers/ So when you hear it thunder don’t run under a tree’. It’s almost a commentary on Gurdjieff’s idea of the transformation of negative emotions. And also an enrichment of what I wrote about as ‘The Saintly Dust of Humanity’. Let alone an echo of the story of ‘manna from heaven’ in the story of Moses. And even an extension of Shakespeare’s ‘The quality of mercy is not strained/ It droppeth as the gentle rain upon the place beneath’. The song speaks to me of the early version of All and Everything in which the reconciling will of God enters into every triad even down to the lowest level. This must be the basis for reciprocal maintenance because the message is that in some ultimate way all creatures are equal in the sight of God. 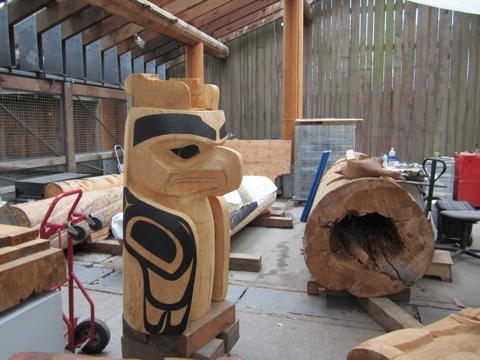 Story Pole Workshop, Vancouver B.C. The introduction tells the story of the transition from everything running wonderfully, smoothly, delightfully, to something that has a different tension to it. When everything runs wonderfully, smoothly, delightfully, perception loses it’s edge. Entropy sets in. Information is lost, because no new information is being produced. The sky is always blue. The moon is always new. Perceptual nets operate not simply on the rate of change, but on the rate of the rate of change. Perception is a field of acceleration like gravity. Perhaps this approximates in informatic terms Gurdjieff’s key idea about a shift in world system, from the system he called the autoegocrat to the system called the trogoautoegocrat. In terms of information production, in the autoegocratic system no new information is produced, and so therefore its informatic content starts to leak away. With the trogoautoegocratic system, there is provision for dispersion as well as for concentration and new information is produced. The new element is what you pay for this process of informatic renewal. In human terms, you must be able to perceive across a wider bandwidth. Shifts in perception are required. Shocks. Thus, getting your clothes wet in the rain is a delightful humiliation. The poetry flows from the oxymoronic wound. 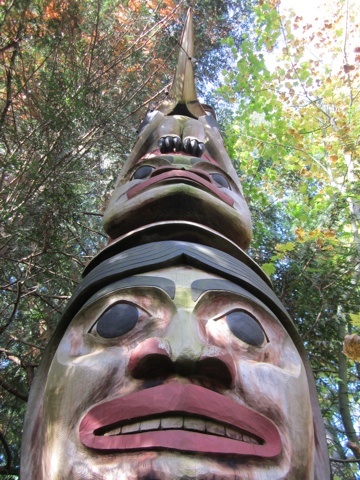 Native Story Pole, Vancouver B.C. That popular music can provide more than a flippant touchstone into such musing is a fine thing. Deep thoughts provide a basis for deep feeling, and vice versa. In performing this song I struggled with how to hit the feeling in it. I could not come straight at it. If something started trembling in my breast as I sang, and I began to want to express this feeling energy directly, then the singing suffered. I breathed at the wrong spot, or pushed too hard. It’s difficult now to try to put myself there in the singing of it to say exactly what I discovered, though certainly it had something to do with technique. Eunji, who plays piano and sings the harmony so breezily in this recording, is the musical director of this duo, and she is merciless in her insistence on singing the notes just as they are noted on the sheet. As a folk musician who relies on my instinctive sense of music, this was often a painful regime. Nevertheless, I had consented to it from the outset, and this consent led to learning something new-for-me about how technique is a container for music. The “pennies from heaven” moment is that keeping the moving part of my singing apparatus working properly as per the “notes” opens up the other parts of the song. Now I know this may sound obvious to some, but what isn’t as obvious is that opening up room in the moment of performance, however that might be, allows for gravity. Something accelerates. It is a sly way, perhaps, of letting the field find you.